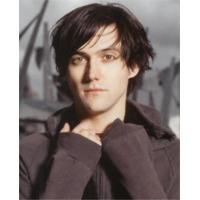 Conor Mullen Oberst (born February 15, 1980) is an American singer-songwriter best known for his work in Bright Eyes. He has also played in several other bands, including Desaparecidos, Norman Bailer (The Faint), Commander Venus, Park Ave., Conor Oberst and the Mystic Valley Band, and his latest project, Monsters of Folk. Conor Mullen Oberst was born and raised in Omaha, Nebraska and went to Creighton Preparatory School. He was born to Matthew Ryan Oberst, Sr., an information manager for Mutual of Omaha, and Nancy Oberst, current director of elementary education in Omaha Public Schools. He grew up with two older brothers, Matthew Ryan Oberst, Jr., a teacher and part-time musician best known for playing in Sorry About Dresden, and Justin H. Oberst, a lawyer. Oberst's mother claims that he was banging on a piano since he was two years old. Besides his brother Matt, Oberst's father was also a musician who played guitar and piano for various cover bands in his youth, and together they began teaching Conor to play guitar at the age of 10.